Apple's iPhone continues to overshadow Samsung in consumer appeal, as a quick look at Twitter activity during the two tech giants' flagship device announcements shows the latest iPhone 5 netted more five times as many messages compared to the Galaxy S4, says one analyst. In a note to investors, PiperJaffray analyst Gene Munster said the Twitter analysis regarding the iPhone 5 unveiling compared to Samsung's recent Galaxy S4 announcement illustrates the mass appeal Apple's handset still carries with the overall consumer marketplace. 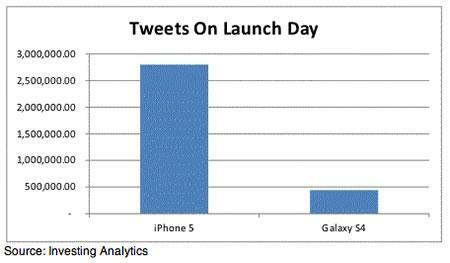 The data, from Investing Analytics, shows that on the day of and day after the devices' respective debuts, the iPhone 5 garnered some 2.4 million tweets, while the Galaxy S4 managed 440,000. Interest for the S4 was higher than Samsung's previous releases, but the numbers don't come close to Apple's traditionally high metrics. "We believe this demonstrates that while interest in the Galaxy S4 is growing, Apple continues to hold a meaningful lead as the smartphone with the broadest consumer appeal," Munster said. Going deeper, tweets about the Galaxy S4 were more positive than the iPhone 5, with a positive sentiment biases of 81 percent of 81 percent and 73 percent, respectively. Munster noted the comparatively negative results could be a byproduct of iPhone 5 leaks leading up to launch day, which left some consumers underwhelmed as there were no "surprise" features. While the study may seem anecdotal, as not every consumer looking for a new smartphone uses Twitter's platform, the demographics represented does lend a good deal marketshare to buying the latest and greatest tech products.